You are about to play the popular Video Slot Lucky Rabbits Loot, and WOW this is a cool game! The design is nothing like you´ve seen before. Check it out and you´ll see! 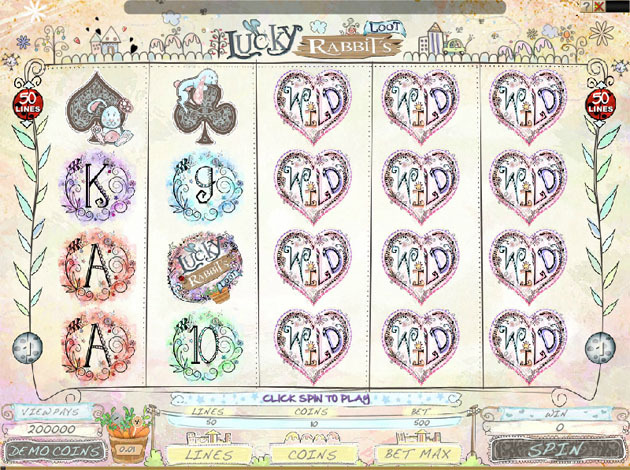 Except for the cool design, Lucky Rabbits Loot is packed with Free Spins and other nice bonus features. You´ll find Scatters and Wilds, all there to increase your winning chances. With 50 paylines and a wide betting range we are certain you´ll like this Video Slot. No matter the size of your wallet, it will fit you perfectly.